This weekend was not the typical early November weather we usually see in Wisconsin. Mid 60's all weekend long. We could not have asked for a better weekend to get those last minute things completed outside before winter hits. I managed to work on a little DIY project despite wanting to be outside all weekend. I was thinking of some cute little gifts to give to friends and family for a small Thanksgiving treat. 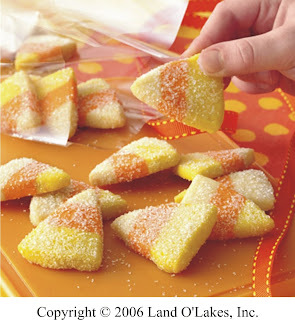 I ran across this recipe to make these adorable little Sparkling Candy Corn Cookies. How cute are they? They taste great too! 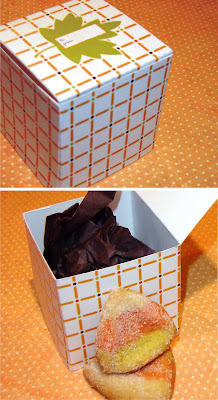 So I thought those sweet little cookies needed a nice little home so I designed a little treat box to nestle them into. About 5-6 of these petite cookies will fit nicely into the box. I've designed a template for you to print, cut and fold up these little boxes. You can print one that has a leaf motif on the top with, "from and to" here or if you prefer one without you can print that one here.